Heat a pan and add 2Tbsps oil. When oil is hot add cumin seeds, cinnamon, cloves, cardamoms, red chili and black pepper. Fry for a while and then add chopped green chilies, chopped ginger and fry. Then add cashew nuts and grated coconut to the pan and fry. Then add grated bottle gourd and 1/2tsp salt. Fry the mixture till water evaporates from bottle gourd. Then add turmeric powder, red chili powder, kasoori methi and mix well. 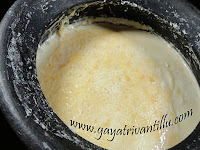 Switch off the flame and transfer the mixture to a bowl and cool it. Grind the mixture adding 200ml water to a smooth paste. Heat a deep and wide pan and add 2Tbsps oil. When oil is hot add the ground paste and tomato paste and mix well. Add 1/2tsp salt and 1tsp red chili powder and cook covered to avoid splatters. Cook on medium flame stirring in between for 15 minutes. By the time the mixture is dry oil separates. Now gravy is ready. 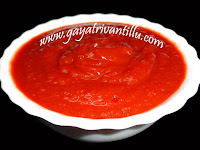 Use this gravy and make varieties of vegetable and paneer dishes. With the measurements given above we get 2 3/4Cups of gravy. Grated coconut may be replaced with melon seeds (magaz) or poppy seeds to get different flavor.Instead of adding 200ml water it is advisable to grind the mixture adding the tomatoes—this would also save the cooking timeand also the splatters of tomato mixture while cooking.